﻿﻿﻿﻿﻿﻿﻿﻿Citizen science gives Texas Stream Team a good reason to go paddling. ﻿﻿﻿﻿﻿﻿﻿In Texas, outdoor recreation is more than just fun; it’s a way of life. With more than 191,000 miles of beautiful Texas streams, creeks and rivers to discover, it’s no surprise that paddling is one of Texans’ favorite outdoor activities. While in a canoe or kayak, we’re fishing, birding, nature watching, waterfowl hunting and taking photos and videos. 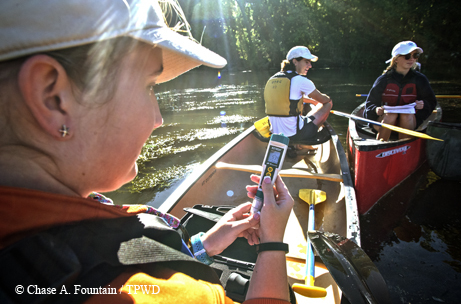 Now paddling enthusiasts can help protect the water they love by keeping track of basic water quality parameters, including dissolved oxygen, temperature, pH and other important indicators. The Texas Stream Team has been combining outdoor recreation with citizen science since 1991. Managed by the Meadows Center for Water and the Environment and funded by the Texas Commission on Environmental Quality, the Texas Stream Team has certified nearly 8,000 individuals on water quality monitoring techniques. To date, participants have donated approximately 45,000 hours, or $1 million worth of time, to monitoring Texas waters. This extensive data set helps support professional monitoring efforts, and the monitors act as an early warning indicator system. Traditionally, Texas Stream Team members have performed their monitoring duties from the shoreline. However, recognizing the potential scientific value of the growing number of paddlers in the state, the Meadows Center introduced the new Texas Stream Team Paddlers initiative in February, inviting kayakers and canoeists to merge their recreation with conservation. The goal is to encourage paddlers to add to the citizen science effort by collecting data from new or hard-to-reach locales. ﻿Texas Stream Team Paddlers combine recreation and science by keeping track of water quality measures on paddling outings. These University of Texas students conducted water tests on the Colorado River near Bastrop. Some interested groups have already joined the team. Austin Canoe and Kayak has set up hubs in Austin and Houston, where trained participants can pick up a monitoring kit and hit the water. Master naturalist chapters from across the state have scheduled trainings, and kayaking/canoeing clubs have begun organizing as well. To get started, gather up five to 10 people who are willing to go out on the water and monitor once a month. Call or email Travis Tidwell at the Meadows Center (512-245-9148 or txstreamteam@txstate.edu). Once trained, Texas Stream Team Paddlers will pick up their monitoring kit, paddle around, make some recordings at the designated location and drop off their kit and data sheet at the end of the trip. Out on the water, monitoring takes approximately 10 minutes and then you’re free to enjoy the rest of your trip, whether just taking a leisurely paddle or searching for that fishing sweet spot. “No natural resource has greater significance for the future of Texas than water,” says Andrew Sansom, Meadows Center executive director. Joining the Texas Stream Team is a great way to contribute to water stewardship in Texas. Just don’t forget your fishing gear.